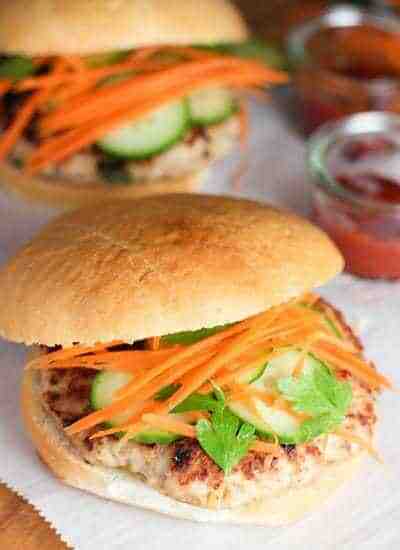 You are here: Home / Chicken / Thai Chicken Burgers with Kicked up Ketchup! This Thai Chicken Burger and Kicked up Ketchup is our new favorite burger around here! Using ground chicken, we could incorporate all those yummy Thai flavors we love! My experience with Thai food is fairly limited…not that we don’t like it…. we just don’t seem to get around to eating it – some new burger, fish and chip joint or wine bar downtown seems to get in the way! I’ve always loved the idea of a spiced up burger and love sliced cucumbers on my sammies for lunch so this made perfect sense to me. 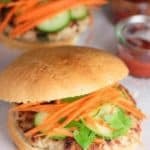 Tips to make this Thai Chicken Burger with Kicked up Ketchup! I used ground chicken in lieu of a whole chicken breast so I could incorporate all those wonderful Thai flavors directly into the meat. A used a mix of dark and light ground chicken. If you use all ground breast meat, it is going to be a bit of a dry burger, but you could give it a try. I added a bit of panko crumbs to help bind it together. Never fails, every time I use panko somebody sends me a note asking for a ‘Paleo Version’. My answer is: leave out the Panko crumbs. It will be just fine – might not hold together perfectly but it will be very close! See? I saved you a note my Paleo friends! Fish Sauce – now I know nothing about Fish Sauce (however I do now know that it smells ‘awkward’). However, that flavor doesn’t cook through. Instead you get a rather mellow but distinct flavor that really enhances the burger. Have you ever heard of umami burgers? Fish Sauce is the secret ingredient to what is supposed to be the best burger in the world…yes, the world…mwhaaaaaa! The Japanese consider umami to be the fifth primary taste right after sight, hearing, smell, touch and taste. And that is your cultural lesson for the day….. I cooked theses up in a skillet on the stove. No need to endure the Seattle weather and use the grill….in fact I think skillet cooking for these are perfect as it allows the juices to remain in the burger. Looking for more burger options? – you might want to try Avocado Burgers and Tropical Chicken Burgers! An easy to make wholesome burger with all the Thai flavors that we love! Mix all burger ingredients together in a large bow. Do not over work the meat or it will get tough. 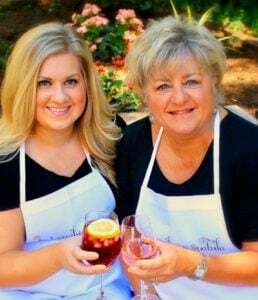 Heat skillet or grill to medium high heat. Cook burgers for 4-5 minutes on each side or until meat thermometer registers 165. Mix all ketchup ingredients together in small bowl. Serve burgers on bakery roll topped with cucumber, carrot and kicked up ketchup on the side! Hi! This is a beautiful image that looks so darn delicious. Thanks for coming by my website and leaving a comment on the slow cooker. I hope you win… you really need a new one! Ha!